When it’s time to replace your furnace, you might have to think faster than you’d like about this major purchase. Here are some pointers. Get several installers’ quotes before you hire one, and ask for detailed, itemized proposals rather than job bids so you can be sure you’re comparing apples to apples. Don’t go with the lowest bidder, as they’ll often lead to more repairs. Research the equipment, and stick to brands you recognize and trust. As for efficiencies, the US Department of Energy has made your choice a little easier. 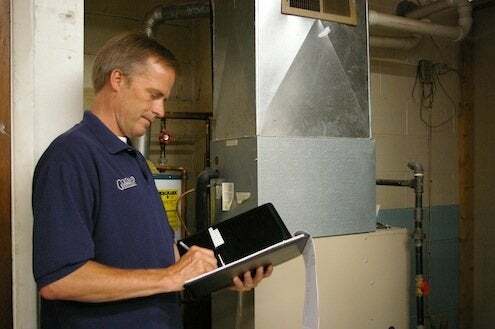 As of May 2013, newly installed gas furnaces in some states must be rated at least 90% AFUE, which stands for Annual Fuel Utilization Efficiency. You can get higher efficiency units, but they’ll cost more and if your contractor adds more than a few hundred dollars’ markup, you won’t get much return on your investment. Then again, older units were often oversized. You may come out ahead by buying a smaller-sized unit which, because it’s more efficient, puts out just as many BTUs as your old clunker did.